Before MST3K there was THE TEXAS 27 FILM VAULT! Before Joel and Mike lovers of bad movies had Randy and Richard! Before Devil Dogs, Observers and Deep 13 there came Cellumites, giant rats and Level 31! In the mid 1980′s a two and a half hour-long program called The Texas 27 Film Vault was the show to watch on Saturday nights for wry mockery of Golden Turkeys preceded by episodes of vintage Republic Serials like Radar Men From The Moon and Canadian Mounties vs Atomic Invaders. Courtesy of a photo from T27FV‘s Randy Clower and through more research of my own in old Dallas newspapers from the 1980’s here are some more bits of trivia to add to Balladeer’s Blog’s ever-expanding cache of info on this unjustly neglected Movie Host program. 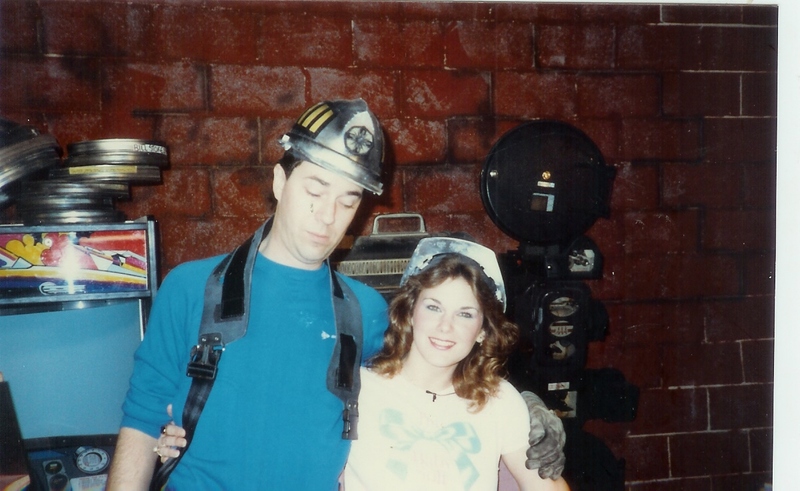 Above is a shot of Randy with fellow Film Vault Corps member Laurie Savino (both mostly out of uniform)! Laurie was also featured in the 3D Texas 27 Film Vault poster that I posted recently. Laurie’s duty in the quasi-military Film Vault Corps ( “The few … the proud … the sarcastic.”) was Mystery Clip Technician. MCT Savino would show a brief, tantalizing fragment from a previous bad or campy movie that Randy and Richard had presented and viewers could write in with their guesses on which flick it was from. Correct answers could win anything from cash prizes to Film Vault Corps T-shirts to coveted action figures of Randy, Richard or co-star and co-creator Ken “Tex” Miller! Hot woman! We have the best here in Texas! Very cool show! It’s obvious how influential it was! Like seriously! I think the Film Vault Corps had more potential than silly things like planet destroying, etc. Thanks for commenting! I agree The Texas 27 Film Vault was blazing a trail! I never said otherwise, I simply point out that The Texas 27 Film Vault came first. And I only started doing that when Misties started emailing me claiming Randy and Richard imitated MST3K. Funny show! I could never remember the name of it! Thanks for sharing! I remember when The Texas 27 Film Vault showed the original The Fly and then the next week Return of the Fly on back to back weeks leading up to Randy and Richard appearing in person at the premiere of the Cronenburg remake of the Fly. Good times! Wasn’t the show like 3 hrs long? It was 2 1/2 hrs long. Except for the double feature night when it was 4 hrs long. Thanks for sharing your memories of The Texas 27 Film Vault! I’m slowly but surely piecing together some pieces of the show’s history! Feel free to email me if you remember more! And tell any other fans of this unjustly forgotten show about my T27FV entries! Ha! Now is that nice? Thanks! I know I always enjoyed the show! MST3K was actually after this show?